Every year our friends raise their eyebrows at us when we say we are going to Austin over spring break. “Do you know it’s SXSW?” they ask, as though that would be the reason to steer clear. They must have missed the memo that SXSW is where it’s at for children’s music. What people don’t know is that South By Southwest (SXSW) is surprisingly accessible to families. You don’t have to commit to the whole SXSW deal, there are many free, non-wristband events available with a low-key, kid-friendly ambiance. My 12-year old’s shirt — love it! It was a Willie Nice Day! This is the second year now that I’ve dragged my family down to Austin for a day or two of live music over spring break. For our schedule the tribute concert hosted by Spare the Rock at the Scottish Rite Theatre has become our favourite event to catch. It’s a fabulous come-and-go event with an impressive lineup of our favourites in a charming, historical theatre. Air conditioning and actual seats are not the only reason to favour this event, but it doesn’t hurt either, nor does it hurt to have trampolines and food trucks outside and other attention grabbers in the lobby. It is, after all, a day-long event. Last year was a David Bowie tribute concert wherein the groups would play a Bowie song or two, in addition to some of their own works. 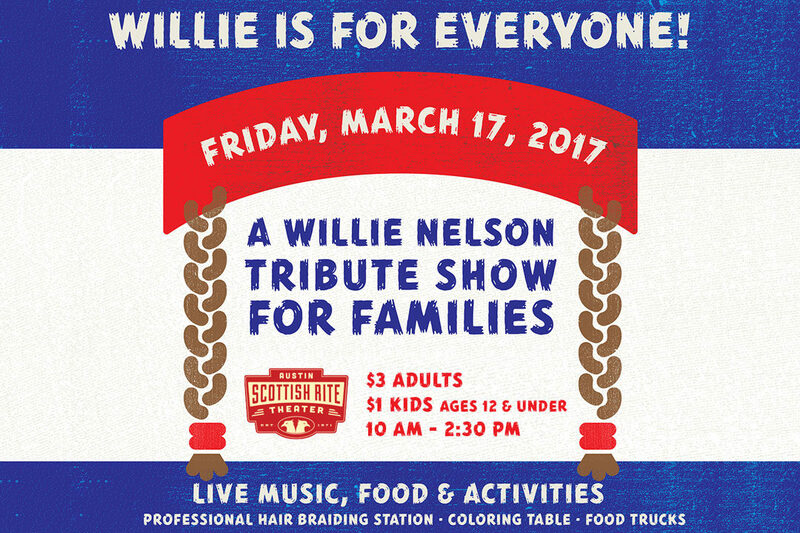 This year the tribute was to Austin’s own Willie Nelson, entitled Willie Is For Everyone. We were able to catch performances from many of our old favourites, saw some new (to us) acts, and met up with some of the artists in the lobby. Some of these performers are starting to feel like old friends, like Lucky Diaz, some of them are new friends with whom I’m certain my kids would be best friends if we lived in Austin, like Rockaroni and Cheese from whom my kids bought a DVD after the show which we have had so much fun watching and who have definitely inspired my kids to keep stretching their creativity. Lobby lighting isn’t great, but the kids loved meeting Red Yarn. See that CD I’m holding? If you haven’t read my review yet of this great album you MUST! The final act of the day was a collaboration of everyone still remaining at the theatre all returning to the stage to sing one last Willie song together. It was a beautiful thing. I think in a lot of industries there’s some fierce competition but the kindie artists as I meet them all seem to be so genuinely welcoming. Maybe it’s the power of music, or maybe it’s that making music for children takes a special personality. Whatever the reason it’s always heartwarming to see them reach out, help each other out, collaborate on the fly, and all come together for the love of music. As Bill Childs, the MC and host of the show (as well as the radio show Spare the Rock Spoil the Child to which you must tune in) closed out the day he threw out the idea that maybe next year’s tribute could be Dolly Parton. The musicians cheered and I could see their brains already working on which songs they’d like to incorporate and make their own. That’s when it hit me just how versatile these people are as musicians. There are no strict genre boundaries, they are willing to look everywhere for good music and stretch their own perspectives. What do David Bowie, Willie Nelson, and Dolly Parton have in common? Only the right musician can make them all accessible to the same young audience. I received no compensation for this post or for any part of this event.